Android refresh rates: ICS passes 2.1, 3m Nexus units? Bang on schedule, Android 4 (ICS) has passed Android 2.2 in penetration of the active base (defined by Google as devices accessing Google Play in the last 14 days). 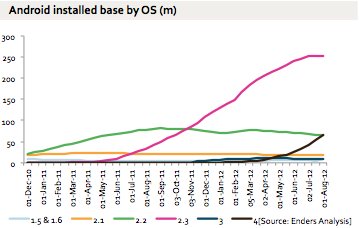 Android 2.3 passed the previous-but-1 version, 2.1, in June 2011, roughly the same interval. Using my model of total active Android devices, that means there are about 66m ICS devices, and about 250m 2.3 devices. Google has also given a figure for Jellybean devices for the first time: 0.8%. On a pro rata basis, this would be about 3.4m devices. The majority of these are likely to be the new Nexus 7 tablet, but some will also be the Galaxy Nexus handset. Only Google knows how many, of course. The caveat for these absolute numbers, of course, is that we do not quite know how representative of the overall Android base the devices connecting to Google Play really are.